I was recently reading an article titled “Macroscopic heat release in a molecular solar thermal energy storage system” (https://pubs.rsc.org/en/content/articlehtml/2018/ee/c8ee01011k) that is related to the idea of renewable energy storage. This is a fascinating topic, one of great importance for our future energy needs, and is related to the idea of chemically storing sensible heat in the transformation of one kind of material to another. In this research, scientists are said to have made a breakthrough in renewables for energy storage of a solar thermal fuel that is claimed to be capable of storing the sun’s energy for up to 18 years. 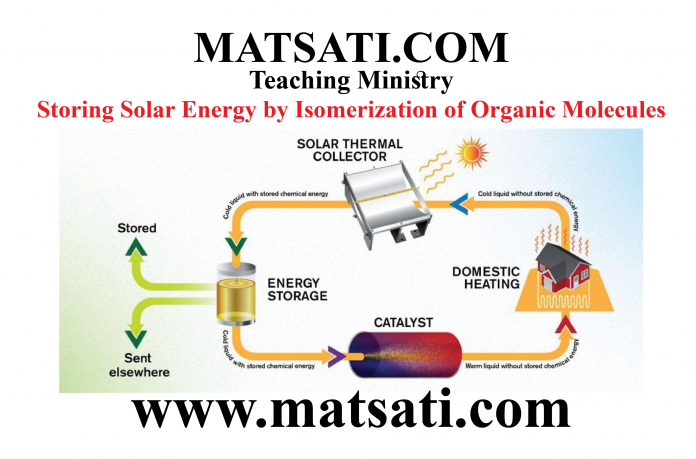 This approach is a method for storing thermal energy an alternative to batteries and heating elements. This concept uses a thermal fluid that is capable of holding the sun’s energy for long periods of time. This thermal energy then can be extracted on demand. This type of energy storage is significant in the application of heating residential and commercial homes or offices. A thermal fluid is composed of the typical atoms for an organic molecule, carbon, hydrogen, oxygen, and nitrogen. The molecule of choice in this study is norbornadiene (Molar mass: 92.14 g/mol, Formula: C7H8, Density: 906 kg/m³, Boiling point: 193.1°F (89.5°C)). The energy storage mechanism occurs by exposing the norbordadiene to sunlight, some of the bonds between the atoms are rearranged to form quadricyclane. What is occurring here is a chemical conversion into a different molecular structure by a process known as isomerization. In chemistry, isomerization is the process by which one molecule is transformed into another molecule which has exactly the same atoms, but the atoms have a different arrangement e.g. A-B-C → B-A-C (these related molecules are known as isomers). The transformed (or energized) molecule is stable with strong chemical bonds, meaning these newly formed bonds form a stable structure. This is the key to storing energy for 18 years according to the researchers. The extraction of the energy is achieved by passing the fluid over a catalyst which changes the molecule from the quadricyclane back to the norbordadiene structure which releases heat (an exothermic reaction). This exothermic reaction releases 63 degrees Celsius (113 degrees Fahrenheit) of sensible heat. This means a room that is at 70 degrees Fahrenheit, the fluid would heat up to 183 degrees F. This amount of heat is sufficient to heat a home or commercial building. The thermal fuel requires no outside input beyond the sun and can operate in a closed loop system. This is a fantastic example by reason that it is single source (sunlight) having a transformational influence upon a organic chemical that can then be used in a very practical way. Can you think of another process that occurs in a similar fashion according to the Scriptures? The Torah describes the covenant the Lord God Almighty has made with those who believe in Him in the following way. In Parashat Ki Tisa, we read in Shemot / Exodus 34:10 the Lord God Almighty saying to the children of Israel that He is making a covenant with the people, and that He will do great marvels, He will do such things that no one has seen before in all the earth. The Lord is not just making a promise of the covenant, He is also telling Israel they are unique, and that He is going to do an awesome thing in their lives. This is a transformational promise the Lord is seeking to do in our lives. Studying the Torah, it is possible to find a lot of prophetic meaning that describes the work and plan of our Father in Heaven and what He is revealing to His people. The Scriptures direct our attention to His Messiah in the sacrificial system. Note that the sacrificial system is in and of itself a transformational process, the animal is laid down upon the altar and burned. The blood, the fat, and the meat are transformed into smoke and ashes. The important point is, there are factors that influence our understanding of the “Messianic hope” that is revealed to us in the Torah and also in the Prophets and Writings sections of the Tanach. The key verses in the Torah that explain to us what the Lord God Almighty is seeking to do in our lives is found here in Parashat Ki Tisa and Vayikra / Leviticus 34:10. This might be the reason why this portion of Scripture is used for the reading for Succot. The Lord has plans to do something miraculous that has never been seen before. The Lord singles us out as His beloved people through whom He is going to perform these miracles. The Apostle Paul understood this concept found in the Torah and spoke of the Lord God doing something miraculous in our lives for those who believe in God’s Messiah Yeshua in the following way. Paul connects the sacrificial system, one giving up his life for another, to a transformational process that occurs being in the Messiah (Christ, Greek for Messiah). The sacrifice of Yeshua resulted in our reconciliation to our Father in heaven. Paul quotes from Isaiah 49:8 and the covenant of God connecting our salvation to both the Messiah Yeshua and to the pattern laid out in the Torah (God dwelling in our midst). The neat point about the scientific research is how the sunlight shines and transforms the organic molecule into a different form. The light empowers the molecule for a future use, to give us life sustaining heat that may be used when it is very cold outside. In a very similar way, believing upon the Messiah Yeshua, the Lord God sends His light, His Spirit, to dwell in our lives literally transforming us into something new (2 Corinthians 5:17, Note this is how the author of Hebrews 1 speaks of Yeshua being the light and wisdom of God). This transformational process does not just empower us to live our lives according to His word (according to the Commands / Mitzvot), but also provides us with a powerful testimony of God and His Messiah working in our lives. This is very significant, and we can understand why based upon what we read in the book of Revelation. In Revelation 12, 14, and 22, we see that the description of God’s People as those who keep the commandments of God and have the testimony of Jesus Christ (Yeshua the Messiah). We are told in 12:17 when the evil one goes on a rampage to exact revenge upon God by attacking God’s people who have the faith in Yeshua and keep God’s Commandments. There is a very real reason why Satan is furious with those who honor God by obeying all that God commands. This is connected to the transformation process of God working in our lives to have the desire to obey His Word. In Revelation 14, we see that the wicked are those who worship the beast and his image, and receive his mark. Obviously they are not those who are keeping the commandments of God because they worship a false god. Only those who keep the commandments of God and have faith in Yeshua the Messiah and our Father in heaven will be saved because the Lord God is actively working in our lives for His glory! In Revelation 22:14 we are told only those who obey His commandments will have the right to the tree of life. This is similar to the transformational chemical process described in the research, the exothermic release of energy will not occur if the transformation had not first taken place. Our excitement for God’s Word, going out into all the world to share the gospel message, will not take place if we first do not have that transformational process in our lives. The Lord God working in our lives, indwelling us by His Holy Spirit, transforming us into something new, and then using that new creation for His purposes. This is what faith and our relationship with God is all about! In a Midrashic sense, we can see how this too is a catalytic transformational process when the Lord God changes us and uses us for His Glory!